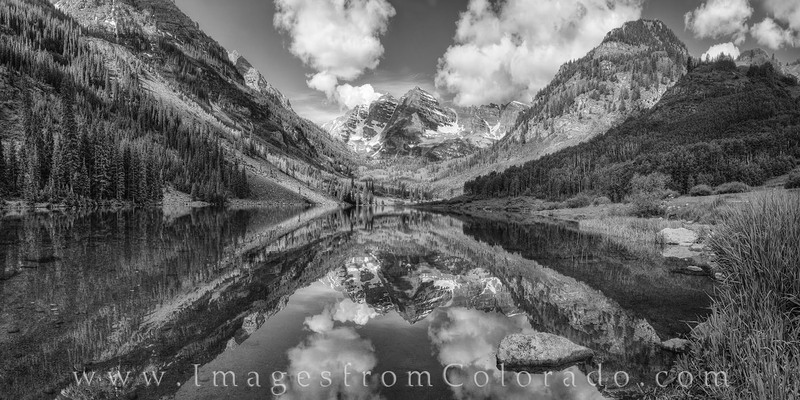 On a perfect summer morning, Maroon Peak and North Maroon Peak reflected in the calm, still water of Maroon Lake in this black and white photograph. The Maroon Bells are the most photographed mountains in Colorado, and for good reason. Landscapes like this are not soon forgotten, and the beauty of the Elm Mountains is unparalleled. Photo © copyright by Rob Greebon.